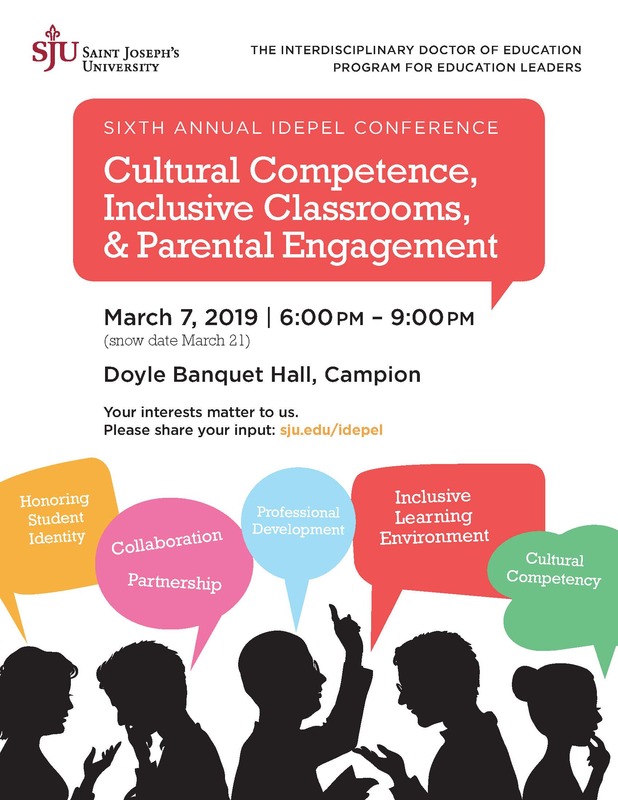 Welcome to the 2019 SJU IDEPEL Conference! Cultural competence does not mean alienating one group of people for another. Cultural competent classrooms honor different cultural beliefs, interpersonal styles, attitudes, and behaviors. Seeing with a culturally competent lens allows educators the ability to educate students in a way that recognizes and accommodates the culture, traditions, and norms that shape the student’s identity. Parental engagement is vital to student success and critically impacts student behavior, academic achievement, and student attendance. As advocates, parents are able to partner with teachers/administrators to be part of decisions related to promoting academic success and enhancing community outreach and support. Parents bring with them a wealth of talents that help to support the mission and curriculum of these institutions. Thursday, March 7, 2019 (snow date March 21, 2019) | 6:00 p.m. – 9:00 p.m.
Buffet reception will also be provided. Register here and join us!